If you are looking for a new homes location that offers the best of both worlds – then Linden Homes Midlands’ Carpenter’s Place is the development for you. However, time is running out to buy at the commuter-friendly development, where over 80 per cent of the new homes are now sold. 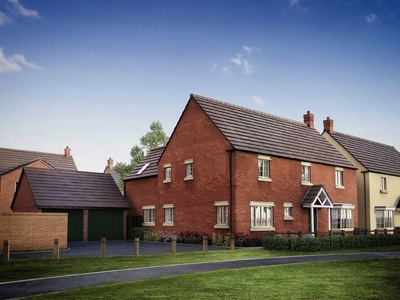 Offering an exciting range of 139 high quality two, three and four-bedroom homes in terraced, semi-detached and detached styles, Carpenter’s Place is perfectly positioned for commuters to Northampton and Milton Keynes, both less than 22 miles away. Situated off Northampton Road in the delightful Northamptonshire town of Brackley, here you’ll benefit from a friendly local community, good shops and leisure facilities and an excellent range of schools. The remaining homes currently available are a selection of four-bedroom properties – ideal for the modern family, starting in price from £368,000. And Linden Homes Midlands can also help curb the cost of moving to this popular development through a series of incentives to help first time buyers and existing homes owners. Schemes include Help to Buy and Part Exchange. In additional, there are also huge benefits to buying a brand new home over a second hand property. - Older homes may have more character but they also need more maintenance than new ones, like new guttering, replacement windows or extra roof insulation. - Energy efficiency is a major benefit. New homes are well insulated, and include double-glazing as standard, making them cheaper to run than older homes. The costs of heating a new home will be substantially lower than a comparable older one. - New homes offer a blank canvas. Buyers can choose kitchen units and bathroom wall tiles, subject to the build stages. A new garden means there is scope for unique landscaping to suit a customer’s individual taste. - Building warranty - all new homes come complete with a New Homes Building Council 10-year guarantee or similar warranty. As well as a valuation on a second hand property, most would-be purchasers would need to pay out for a homebuyer’s report - and then there is the possibility of a full structural survey on top of that! - New homes often have features many buyers may take for granted, including ensuite facilities and added security aspects including smoke detectors. The sales and marketing suite are open daily from 10.30am until 5pm, alternatively visit lindenhomes.co.uk.